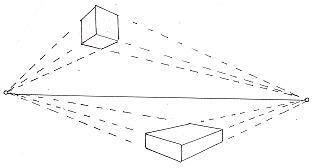 Perspective is the art of giving a flat surface the illusion of three-dimensional depth. In the art world there are several ways to create the illusion of depth and dimension on a flat surface. Accurate line drawings are the most important, but on the fun side of creating perspective are colors, vibrancy, value, contrast, lots and lots of colors. Because we are a very visual group (and don’t like to read!) This will be a picture book of how to’s, lots of visual aids. My kind of instructions. As stated you must first start with an accurate line drawing. 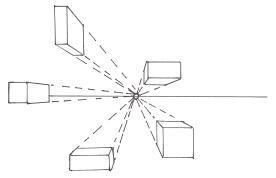 What angle or elevation are you viewing the picture from, are you above it, below it or on the same level. The first thing I always hear in a class is “I don’t know where to shade or highlight.” Without bringing fancy light sources into play using just direct lighting, the shading and highlighting process to give an object form is very simple. Remember this one easy step! Where ever a line is broken or you can not follow it to completion is where there will be a shadow. Note that the center of the flower is an unbroken line. The petal intersects with the center, so where the line of the petal breaks is where the shadow goes. Note the second petals lines are broken by the first petal so it has more shadow area. As you work around the flower the petals vary according to how you draw them. The line for the third petal to the right is broken on both sides, so it is shaded on all sides except the top.